Today (22 May) is a very special day. 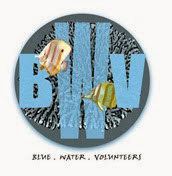 It is the International Day of Biodiversity. At CHIJ Katong Convent, we have a special guest with us today. N. Sivasothi (a.k.a. 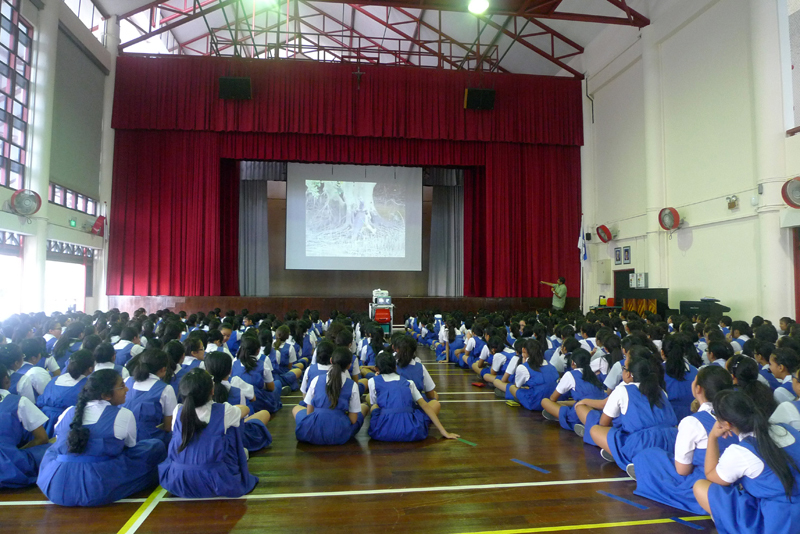 Otterman) came down to give a talk on Marine Life in Singapore and the threat of Marine Trash to the lower secondary students (Sec 1s and 2s). 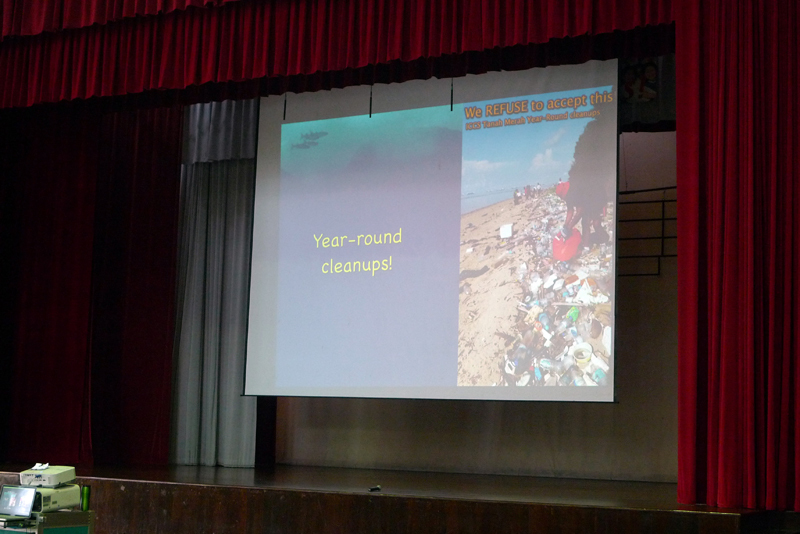 The talk was held with KC's support and participation in the International Coastal Cleanup Singapore for the past few years (at the very least from year 2008 that I know of). Siva introduced himself and a brief description of what he does. 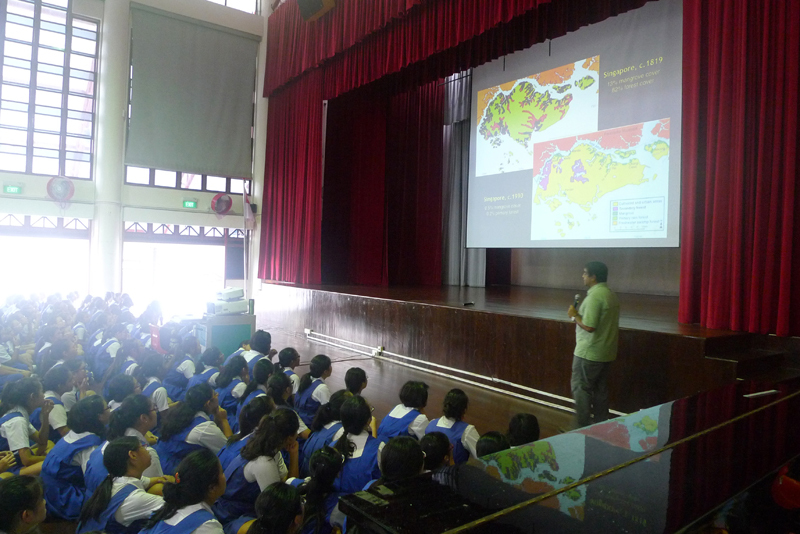 He then moved on to share with the students the mangrove areas of Singapore, both past and present. 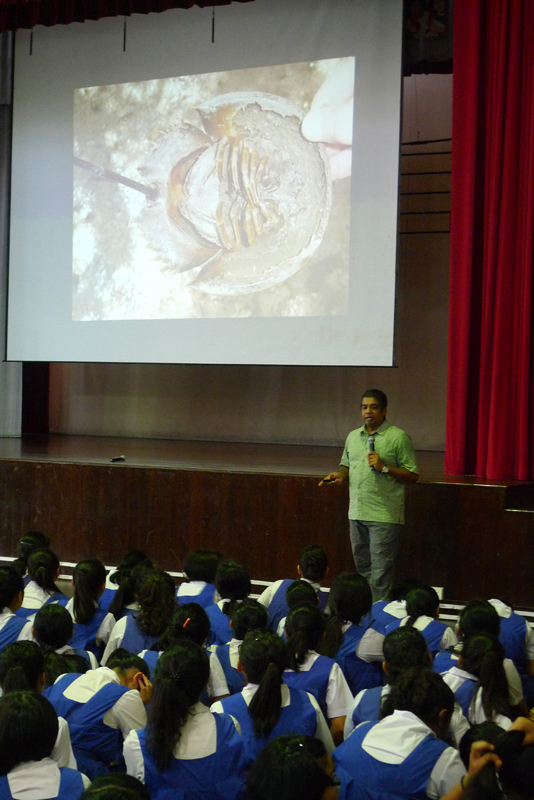 Talking about marine life in Singapore, Siva covered organisms such as sea turtle, otters, water monitor lizards, tree climbing crab (a.k.a. vinegar crab), snakes, horseshoe crabs. Siva first talked about the turtles that visit our beaches to lay eggs. 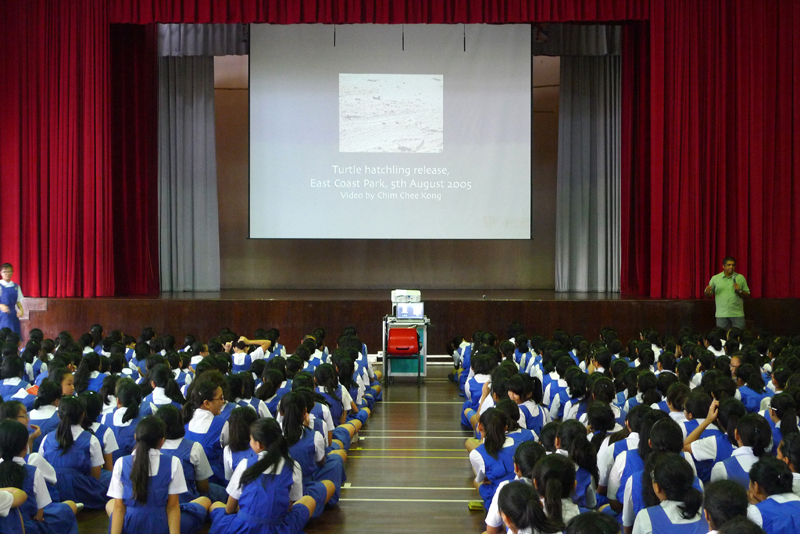 He showed the girls a video of turtles making their way to the sea and talked about the "save the turtle" incident at East Coast Park a few years ago. He then talked about dugong sightings in Singapore. 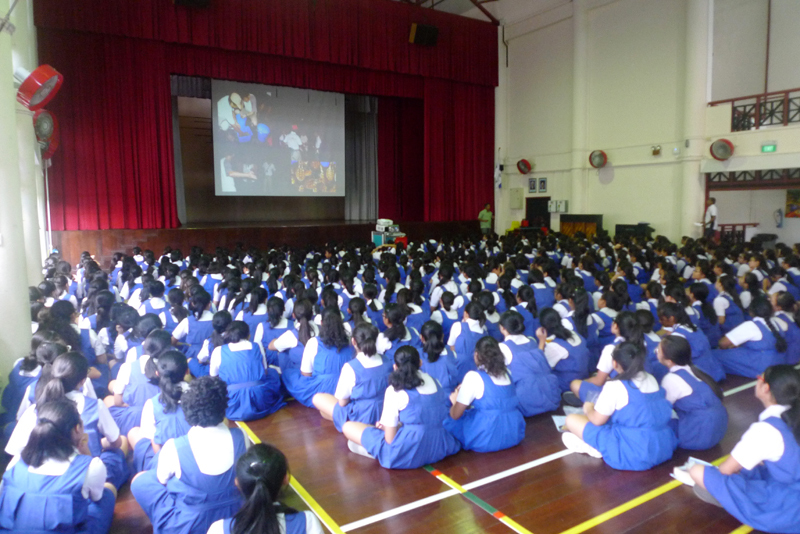 The image of a dugong got some excitement among the girls. 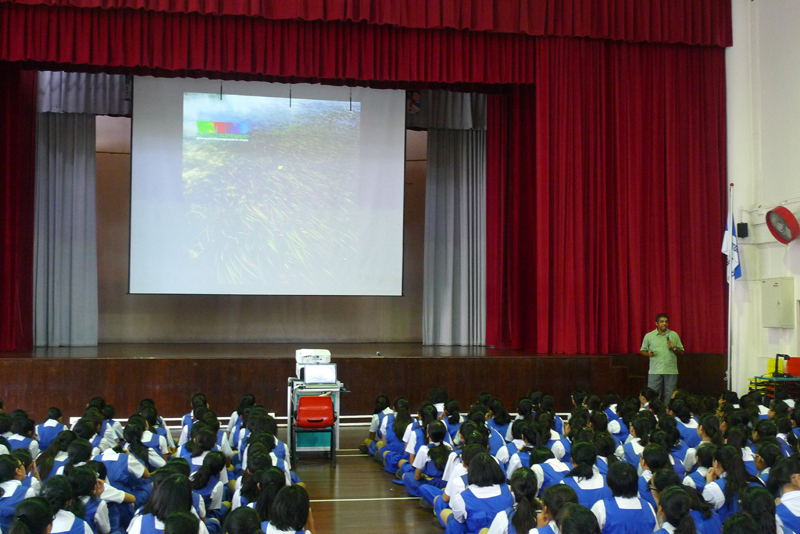 Siva briefly showed the girls where the dugong sightings were made using the map of Singapore in relation to the seagrasses available and the dead dugong incident in Pulau Tekong. The girls were shocked when they knew that the dead dugong consumed 30 over kilograms of seagrass. That is more than half the body weight of most students. When talking about water monitor lizards, Siva said that there is an estimated size of 50 water monitor lizards in Sungei Buloh Wetlands Reserve. How many water monitor lizards are there? 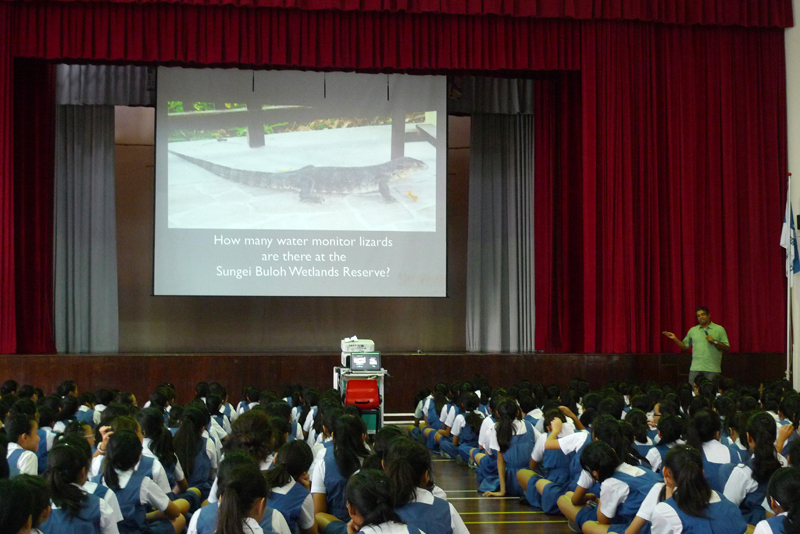 Siva explained that male water monitor lizards will go through a wrestle to fight for territory. The girls were amused when they saw the "hugging" wrestling position in the video. Siva also shared his experience working with the BBC team with David Attenborough and the mysterious sighting of the snake leaping away when released. He then talked about the Sungei Mandai Besar and how he managed to save 300 horseshoe crab trapped in "ghost nets" in 5 hours. 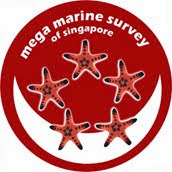 Moving on to the threat of marine trash, Siva introduced the International Coastal Cleanup Singapore and the use of the data collected during the cleanup. Siva surfaced that worrying amount of plastics and total amount of trash collected using the consolidated data from one of the cleanup year. It was indeed shocking. 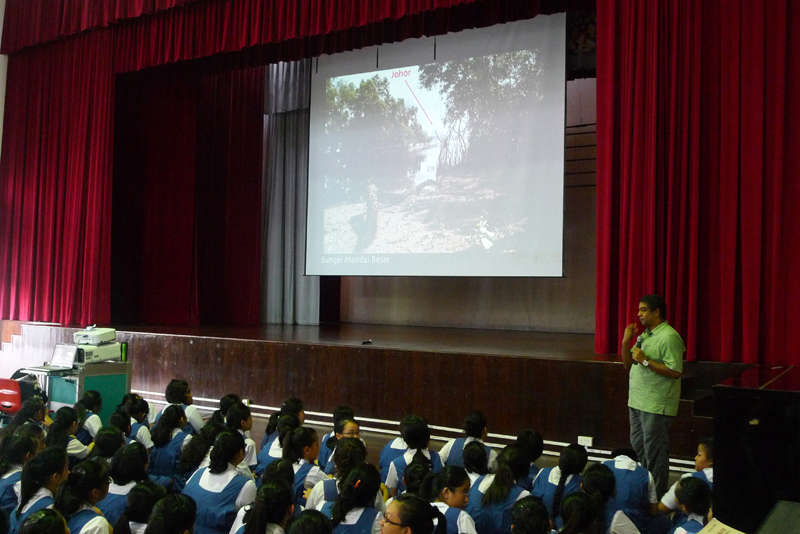 The students were also informed on how the rubbish in Singapore is being incinerated and the ash is transported to Semakau to fill up the land. The final part of the talk shows student the impact of marine trash on the Laysan Albatross. A video of Chris Jordan working on the Laysan Albatross in Midway Island was shown. It was very saddening video to watch as it shows how albatross of different ages undergo a slow death with the plastic contents obstructing their digestive system. Siva mentioned that a film, Midway, is making in progress. Midway shows Chris Jordan's journey in Midway Island with the albatross. More information about the film can be found here. After the talk, some teachers had a quick chat with Siva. One of the topic discussed was about how we can actually play a part in reducing the use of disposal utensils, or encourage the use of cornware products. Siva and I took the opportunity to promote Festival of Biodiversity to the students. Hope that the students will come and have fun. It was a meaningful day of International Day of Biodiversity. Thanks to Siva travelling down to KC despite having a bad flu.